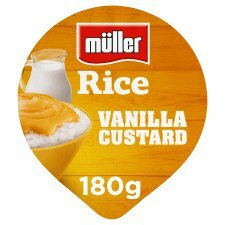 Get the most out of your day with Müller Rice Vanilla custard! A delicious, fat free way to bridge your hunger gap, anytime, anywhere. Made with creamy rice, combined with vanilla and custard its great taste gets you ready to take anything on when the hunger's gone! To eat hot: Carefully remove all the foil lid. Heat on full power for 1 minute, stirring half way. Stand for 1 minutes. (850 watt microwave).